Ive already polished my hull sides due to the limited time on land to do the work. 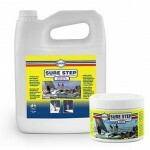 Now I want to complete the Sure Step process on my decks but am afraid the Boat Scrub and Boat Clean Plus will ruin the job I’ve completed on the hull with the subsequent runoff from these products after application. What do you recommend? The runoff from Boat Scrub and Boat Clean Plus will not remove the polish on your hull, . When applied directly to the hull with sufficient concentration and a rubbing action, they will remove wax and polish but the runoff from the deck will not cause any damage to the polish if you rinse it off with clean water before the runoff dries. If left to dry, the cleaners can result in streaking of the dried cleaners. Both of these products are free rinsing and biodegradable so there is no problem applying the Sure Step process when the boat is in the water. Work in small enough areas so you can rinse the runoff off the hull immediately after you rinse the deck. The polish will undergo more damage from acid rain than it will from the runoff of these cleaners.